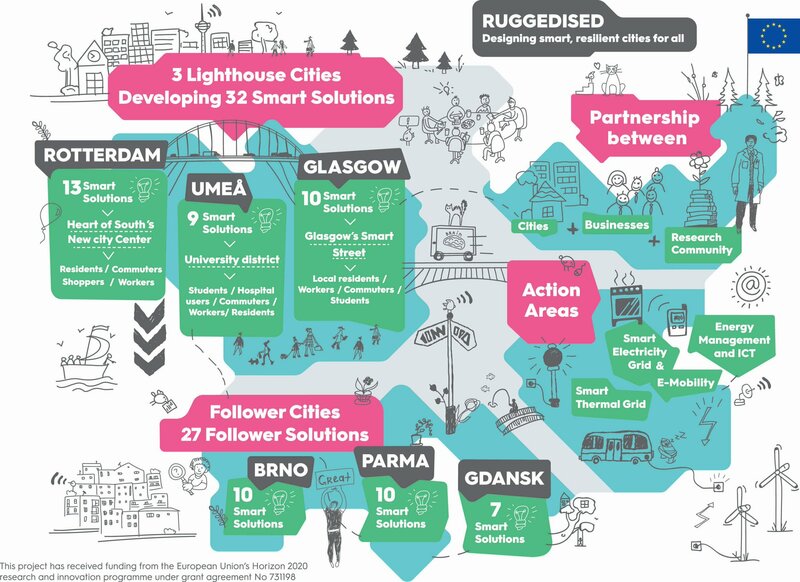 The RUGGEDISED project (Rotterdam, Umeå and Glasgow: Generating Exemplar Districts In Sustainable Energy Deployment) aims to deploy smart city innovations that will enable rapid development and replication of energy-efficient urban districts. Expected results of the project cover not only technologies to reduce energy consumption and CO2 emission but also innovative business models for energy exchange, open-data platforms, and advanced energy management systems. 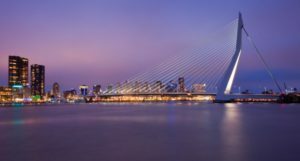 Within five years of the project the cities of Rotterdam, Umeå, and Glasgow will deploy wide range of cogeneration solutions, waste heat recovery installations, renewable energy sources, Internet of Things platforms, smart street lighting, solutions for electromobility, including public transportation. At the same time Gdańsk, Parma, and Brno will work on similar investments whose implementation is expected to begin already during the project. “Ruggedised” will demonstrate how sustainable cities use ICT in order to integrate and optimize their mobility and energy domain. As the project aims to prove the concept of data-driven adaptive city management, relevant KPIs and other indicators will be based on solid data sources, sensing systems, and data warehouses. “Ruggedised” will further implement and evaluate decision support systems, big data analytics and wide range of business intelligence applications in the context of e-mobility and energy management. This almost 20 million Euro project will be carried out by 34 partners from the Netherlands, Sweden, United Kingdom, Italy, Austria, Czech Republic, and Poland. The RUGGEDISED consortium comprises of universities, R&D centres, power utilities, construction companies, public transportation actors, and ICT industries. In direct cooperation with the TNO (Netherlands Organisation for Applied Scientific Research), the Austrian Institute of Technology, and the Institute of Studies for the Integration of Systems (Italy) PICTEC will carry out research and consulting activities, including “a foresight study”, in order to design and deploy innovations in the filed of ICT, energy, and mobility tailored for smart city environments. Heat recovery from streets and sewer system, solar panel car park shades with electric cars chargers – it’s not a song of the future anymore. These and other innovative smart city solutions are currently developed and tested within the Ruggedised project framework. Read the full article (in polish) by Izabela Biała on the City of Gdansk official website. City of Gdansk brought a delegation to visit project’s Lighthouse city of Rotterdam, to learn more about the smart solutions implemented there. Read the full article on the Ruggedised website and a the more detailed report on the City of Gdansk website. 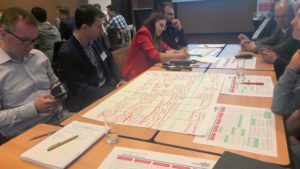 II Forsight Forum, a workshop on the future of Gdansk in the fields of e-mobility, energy efficiency and innovative building, took place in Gdansk. Read the full article on the City of Gdansk website.